Learner's Milonga - what's that? One of my passions is bringing new people into tango. For the past eighteen years I have been dedicated to this goal. I absolutely love the way social tango dancing can be life changing and transformative; all whilst being so much fun! This post is being written on the eve of SoTango fifth Learner's Milonga this year! My co-teacher Pablito and I are loving how this concept is encouraging more new dancers to attend milongas around Sydney and even tango festivals out of Sydney! The Learner's Milonga provides and ideal opportunity for people to dance with a range of dancers (from beginner to experienced dancers) to improve their tango skills and confidence. 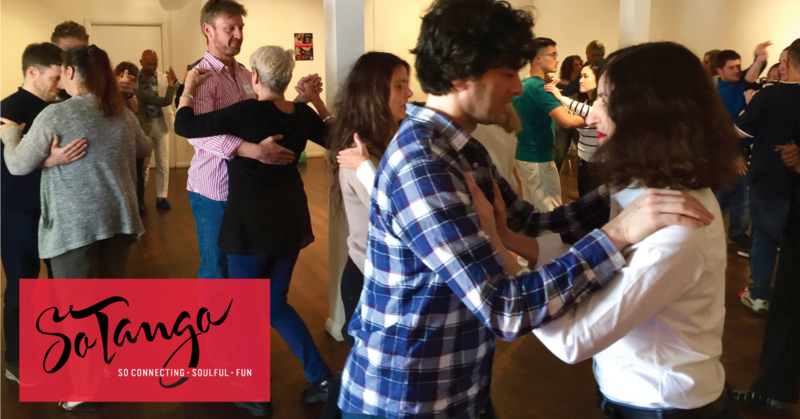 Since its inception in 2013 SoTango has regularly arranged student outings to milongas and practicas around Sydney hosted by different tango schools and Tango Synergy (a not- for-profit association). While some of our students enjoyed the experience, many found the experience quite daunting, opting for (or delegated to) the role of spectator over that of dancer - even at the Tango Synergy Practica which is a probably the most informal and inclusive of all Sydney's tango events. Based on this observation, I identified the need for a tango social event that bridged the gap between taking tango lessons and dancing at milongas. It could be argued that practicas fulfil that need and in one sense they do. Practicas or practilongas (a name we have used for quite a while) certainly help dancers practice moves that they will use in milongas. What they don't do so well is to help people fully acclimatise to the culture and codes of a milonga. Only going to a milonga can really do that. At the same time of coming to this realisation, and with beautiful synchronicity, I spotted an announcement of a Milonga for Learners in Ashfield. The milonga was hosted by my friend Alejandro Ibarcena of Urban Tango who (like Pablito and me) is dedicated to introducing new people into tango. Alejandro has been hosting such milongas around Sydney for some time now. Consequently, SoTango's next student outing was to this milonga. Our students all raved about the experience and it was the first time I saw every one attending from our group dancing a lot and feeling comfortable dancing tango socially. This was a light bulb moment for me. I could see the Learner's Milonga concept worked! Alejandro's event was thus the catalyst to the name of Learner's Milonga. Originally we were going to entitle our event as a Beginner's Milonga, but the descriptor of learner takes away the baggage and subjectivity associated with that of beginner. There really is such a divergence of opinion on what it means to be a beginner in tango. At one end of the scale there are those who (demonstrating the Dunning-Kruger Effect in action) feel qualified to teach after a few months of lessons! Then at the other end of the scale there are those who modestly still call themselves beginners after many years of dedicated training and kilometres on the dance floor…it’s a very subjective title. Essentially we who love tango are all learners - if we believe that there is always something new to learn in tango, and that there is indeed! Here, however the Learner's Milonga is particularly dedicated, as mentioned above, to people who are already taking tango lessons but not feeling confident to attend milongas. SoTango's in Bondi Junction, which occurs every 2 months on a Saturday or Sunday afternoon. Urban Tango's Milonga for Learners occurring on the 4th Saturday night of each month in the Blue Mountains. It's only a matter of time before more Learner's Milongas pop up around the world - as the concept gains traction!